There's no doubting its ambition. 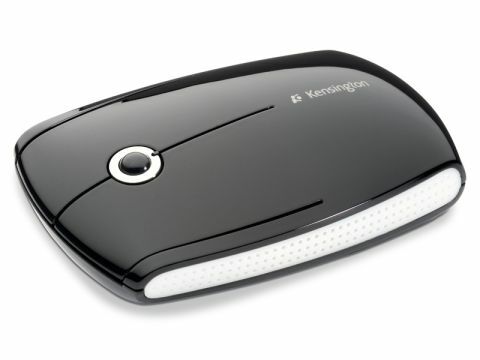 Kensington's two-button SlimBlade Media Mouse not only features a scrollerball instead of a wheel (putting it on a direct collision course with Apple's own Mighty Mouse) but flip it over and you find an iTunes media controller too. This mouse is comfortable and responsive. It looks good and is packed with extras such as a start-up LED indicating battery strength and a slot for the wireless receiver within the unit, so you don't lose it in your bag. It switches off when the computer sleeps to preserve the batteries, which last up to six months. Unfortunately, its two key features are poorly executed. The scrollerball (or 'jogball' to use Kensington's preferred term) offers 360° movement and enables you to scroll horizontally as well as vertically, but it's very temperamental and often fails to function unless you press hard. You find yourself scrolling sideways when you mean to move up or down too, which is annoying. Bizarrely, you can't click it for a third mouse-button function either, but given how hard you have to press to scroll, this might be a blessing. The iTunes media controller on the underside of the mouse is equally underwhelming. Given its superficial resemblance to Apple's remote controller, you'd expect it to offer the same functionality. No such luck. It only functions with iTunes, lowering or raising the volume (on the Mac, not the app), pausing and resuming play or skipping to the next track. You still have to use the mouse to explore your music and video collection. It would've been ideal for Front Row, which is designed to be operated using a D-Pad. The SlimBlade Media Mouse is a brave and belated challenge to Apple's Mighty Mouse. With a better scrollerball and Front Row compatibility it would be a worthy winner, but as it stands, it's not recommended.